CAAF decided United States v. Gaskins, No. 13-0016/AR, 72 M.J. 225 (Gaskins IV) (CAAFlog case page) (link to slip op. ), on Thursday, May 23, 2013, finding that the Army CCA did not abuse its discretion in ordering a sentence rehearing after the Government lost a Defense sentencing exhibit, but that the CCA erred when it found that the Appellant waived the Government’s failure to plead the terminal element of the Article 134 specification, and also finding that this failure materially prejudiced a substantial right of the Appellant. CAAF reverses the ACCA in part, sets aside the sentence, and remands the case to the CCA for a sentence reassessment. Judge Ryan writes for the court, joined by Judge Erdmann and Senior Judge Effron. Judge Stucky writes separately, concurring in part and in the result. Chief Judge Baker also writes separately, concurring in part and dissenting in part. Army Staff Sergeant Gaskins was convicted, in February, 2008, by a general court-martial composed of members with enlisted representation, of carnal knowledge, indecent acts with a child, and indecent assault, in violation of Articles 120 and 134, UCMJ, and sentenced to confinement for twelve years, total forfeitures, reduction to E-1, and a dishonorable discharge. But Defense Exhibit A – a sentencing exhibit consisting of the Appellant’s “good soldier book” – went missing and wasn’t included in the record of trial. That omission began an appellate odyssey that, even now, will continue (since CAAF remanded the case to the CCA for a sentence reassessment). 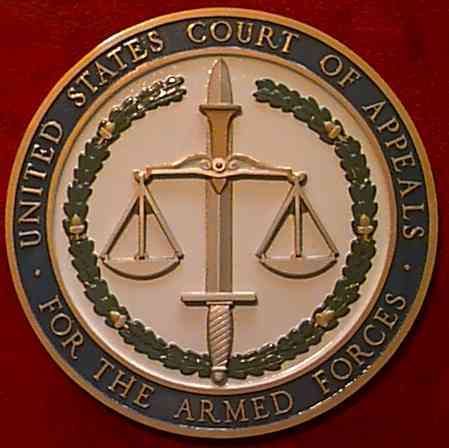 First, a three-judge panel of the Army CCA heard oral argument, but then the entire court issued a published opinion ordering a DuBay hearing “to determine whether substantial matters were omitted from the record and, if so, whether it is incomplete under Article 54, UCMJ.” United States v. Gaskins, 69 M.J. 569, 570 (A.Ct.Crim.App. 2010) (en banc) (Gaskins I). Notably, all three of the judges who participated in the oral argument dissented from the CCA’s opinion in the case (and we remarked about the dissenting opinion this post). Then, as discussed in this post, in response to a defense petition for extraordinary relief, “CAAF put a stop to the appellate rescue mission, precluding the DuBay hearing from proceeding.” The case returned to the ACCA, which issued a second en banc opinion (Gaskins II) (unpublished), setting-aside the sentence and authorizing a sentence rehearing. Again there were dissents, and again the Appellant sought extraordinary relief from CAAF, but this time it was denied and the sentence rehearing was conducted in October 2011, resulting in an approved sentence of confinement for nine years, total forfeitures, reduction to E-1, and a dishonorable discharge. I. Whether the Government’s loss of a sentencing exhibit rendered the record of trial incomplete under Article 54, UCMJ, resulting in a jurisdictional limitation on the sentence to one no greater than that which could be approved for a non-verbatim record. II. Whether Appellant waived the failure to plead the terminal element of the Article 134 offenses by his failure to raise that issue at the sentence rehearing, and if not, whether those charges should be dismissed because the Government failed to plead the terminal element. The problem with both parties’ reliance on R.C.M. 1103 is that the provisions they point to are limited in their application, by R.C.M. 1103’s express terms, to instances where a verbatim transcript cannot be prepared. Id. In this case, the transcript is verbatim, but the record was otherwise incomplete prior to the Appellant’s clemency submission because a defense sentencing exhibit was missing. Where the CCA exercises its authority to order a rehearing on sentence, the record of the rehearing, in concert with the record on findings, constitutes the complete record for review by the convening authority and the CCA, as required by Articles 54 and 66, UCMJ. While R.C.M. 1103(f) does not apply to an incomplete record, it would make little sense to permit a rehearing on findings to create a new record of trial as a remedy for the absence of a verbatim transcript, but not permit a rehearing on sentence to seek to cure any prejudice suffered from a missing sentence exhibit. Slip op. at 13-14. But the circumstances also matter to the majority, and Judge Ryan notes the factors that help CAAF find that the ACCA’s remedy of a new sentencing hearing “was appropriate under the circumstances.” Slip op. at 14. We note that a CCA may order a rehearing where it sets aside a sentence adjudged by a lower court and approved by the convening authority. We further note that, on rehearing, the military judge took extra care to craft remedial measures that sought to cure any prejudice Appellant may have suffered from the absence of DE A. She ruled that any victim-impact evidence in aggravation would be time-limited to the date of the original presentencing hearing. She further ruled that TS could not testify, allowing only a stipulation of expected testimony from TS’s mother. Moreover, we consider the fact that, on rehearing, Appellant’s original sentence, awarded by members who had had every opportunity to review DE A — confinement for twelve years, forfeiture of all pay and allowances, reduction to pay grade E-1, and a dishonorable discharge — was reduced by three years’ confinement as indicative that the ACCA’s remedy was nonprejudicial in this case. Slip op. at 14-15 (citations omitted). Judge Ryan concludes her analysis by highlighting the absence of a statutory or regulatory requirement for “a particular remedial measure to address an incomplete record in a general court-martial, [so] we hold that the ACCA did not abuse its discretion in ordering the rehearing.” Slip op. at 15. Article 54, UCMJ, requires preparation of “a complete record of the proceedings and testimony,” and Rule for Courts-Martial 1103 provides that when a verbatim transcript cannot be prepared, due to loss of the recording, notes, or other reason, the convening authority may approve no sentence greater than confinement for six months, forfeiture of two-thirds pay per month for six months, and reduction to E-1 (a “non-verbatim sentence”); or the convening authority may direct a rehearing (i.e., redo the entire trial) as to any offense of which the accused was found guilty. Army Staff Sergeant Gaskins was convicted, in February, 2008, by a general court-martial composed of members with enlisted representation, of carnal knowledge, indecent acts with a child, and indecent assault, in violation of Articles 120 and 134, UCMJ, and sentenced to confinement for twelve years, total forfeitures, reduction to E-1, and a dishonorable discharge. But Defense Exhibit A – the Appellant’s “good soldier book” – went missing and wasn’t included in the record of trial. That omission began an appellate odyssey that continues next week at CAAF, a half-decade later. The “good soldier book” was a “completely filled 3-inch binder, consisting of Appellant’s Marine Corps service record book, numerous awards from his time in both the Marines and the Army, and photographs and other documentary evidence sufficient to merit consideration by the panel in mitigation.” Appellant’s Br. at 10. It was presented to the members during sentencing and then vanished, and there were (apparently) no copies, tables of contents, summaries of the contents, or other means to adequately recreate the Exhibit. But then, as discussed in this post, in response to a defense petition for extraordinary relief, “CAAF put a stop to the appellate rescue mission, precluding the DuBay hearing from proceeding.” The case returned to the ACCA, which issued a second en banc opinion (Gaskins II) (unpublished) setting-aside the sentence and authorizing a sentence rehearing. 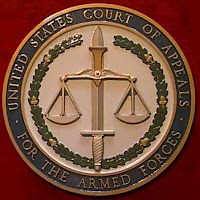 Again there were dissents, and again the Appellant sought extraordinary relief from CAAF, but this time it was denied and the sentence rehearing was conducted in October 2011, resulting in an approved sentence of confinement for nine years, total forfeitures, reduction to E-1, and a dishonorable discharge. Subsequently, in July 2012, the ACCA summarily affirmed the findings and sentence (Gaskins III). About ninety days later, CAAF granted review of the two issues shown above. The Appellant’s brief presents the missing exhibit issue in four parts: First, the loss of the exhibit is a “substantial omission” that renders the record incomplete, creating a presumption of prejudice that the Government must rebut (recognized in caselaw; see United States v. McCullah, 11 M.J. 234, 237 (C.M.A. 1981)). App. Br. at 9. Second, the Government has failed to meet its burden to rebut that presumption of prejudice caused by the incomplete record. App. Br. at 11. Third, the ACCA erred when it remanded the case for a sentence rehearing, because it lacks the authority to do so. App. Br. at 17-18. Finally, even if the ACCA had the authority to remand the case for a sentence rehearing, the record is still incomplete, there is still a presumption of prejudice, and there is still a need for relief. App. Br. at 21-22. United States v. Gaskins, __ M.J. __, N0. 13-0016/AR (C.A.A.F. Oct. 23, 2012). Friend o’ CAAFlog Bill Cassara is Gaskins’ civilian appellate counsel. ACCA’s most recent opinion, from which the current appeal is taken, is available here. United States v. Gaskins, No. ARMY 20080132 (A. Ct. Crim. App. July 12, 2012). Note the resolution of a Fosler issue in the footnote on page 2. ACCA applies waiver notwithstanding the President’s designation of failure to state an offense as a “Nonwaivable ground” which shall result in dismissal “at any stage of the proceedings.” R.C.M. 907(b)(1). Note also that ACCA faults the defense for failing to raise a challenge to the specification at a sentencing rehearing notwithstanding the principle that upon remand, a “court can only take action that conforms to the limitations and conditions prescribed by the remand.” United States v. Smith, 41 M.J. 385, 386 (C.A.A.F. 1995) (quoting United States v. Montesinos, 28 M.J. 38, 44 (C.M.A. 1989)). Here’s the decretal paragraph from ACCA’s previous opinion remanding the case: “The findings of guilty are affirmed. The sentence is set aside. A rehearing on the sentence may be ordered by the same or a different convening authority.” United States v. Gaskins, No. ARMY 20080132, slip op. at 2 (A. Ct. Crim. App. Feb. 10, 2011) (en banc). Note that the footnote observes that “Appellant also made no mention of a Fosler issue in the eleven pages of matters submitted pursuant to Rule for Courts-Martial 1105 on 10 February 2012,” appearing to treat that as relevant to a waiver determination despite the Senate Armed Services Committee stating in its report on the Military Justice Act of 1983: “Because the convening authority is not acting as an appellate tribunal, the accused is not required to raise legal objections to the court-martial in his submission to the convening authority in order to preserve such objections for appellate consideration.” S. Rep. No. 98-53 at 21 (1983). That’s a lot of legal principles to implicate in one footnote in an unpublished summary disposition. We’ve been following the back-and-forth in the Gaskins case, concerning how the loss of a defense exhibit and its resulting unavailabililty during Article 66 review should be remedied. As we noted here, Army DAD filed a petition for extraordinary relief seeking to block the new sentencing hearing that ACCA ordered as a remedy during its most recent review of the case. And as we noted here, on 31 March, CAAF stayed any rehearing on sentence in the case. Now today’s Daily Journal update informs us that yesterday CAAF ordered the respondents to show cause no later than 9 May why the requested relief shouldn’t be granted. Speaking of repeat customers at CAAF . . . .
On Thursday, CAAF once again issued a stay to prevent execution of a remedy ordered by ACCA in the Gaskins case. We’ve posted a copy of the stay order here. We previously noted Gaskins’ request to CAAF to stop execution of ACCA’s remedy here. NIMJ’s blog reports here that counsel for Gaskins have filed a petition for extraordinary relief at CAAF seeking to halt the remand of his case for a new sentencing hearing due to a lost exhibit that rendered the record of his originally sentencing proceeding non-substantially verbatim. You can see all of our previous coverage of the Gaskins case here. On Monday, the Appellant in the ping-pong (due to the ACCA-CAAF-ACCA volleys) case that is US v. Gaskins filed a motion and petition seeking a writ of mandamus against the judges in the majority on the Army Court of Criminal Appeals’ en banc panel that issued an opinion in his case last month. The latest ACCA opinion (attached to the petition) remanded the case for a new sentencing hearing after an unsuccessful campaign to have a trial court attempt to reconstruct the defense’s primary sentencing exhibit (his “Good Soldier Book;” we called it the “I love me” exhibits in the USAF–basically any good paperwork received during a military career). This writ is to prevent the sentencing rehearing from occurring. The stakes here are high for Gaskins and the government. Since the missing exhibit couldn’t be recreated, Gaskins’ dishonorable discharge and 11.5 of the 12 years of confinement that he’s currently serving for having carnal knowledge of the pre-teen dependent of another soldier and other sexual crimes with an adult could be permanently wiped out. This is because the record of trial must be “substantially verbatim” in order for a punitive discharge and any confinement over 6 months to be approved. Given Gaskins’ E-6 grade and time in service (9 years) at the time of his court-martial, no doubt the missing defense exhibit was not a slim document, meaning the record won’t be found “substantially verbatim” without it. I was the defense counsel on a case similar to this, and I can honestly say I wouldn’t want to be in the government’s shoes on this one right about now. Meanwhile, Gaskins remains in confinement. In the wake of ACCA’s decision, Army DAD sought and obtained an extraordinary writ from CAAF calling off the attempt to reconstruct the exhibit. Gaskins v. Hoffman, __ M.J. __, Misc. No. 11-8004/AR (C.A.A.F. Dec. 9, 2010) (summary disposition). But rather than lowering the sentence to the jurisdictional maximum for a court-martial without a verbatim record — as suggested by Judge Ham the Great in her original dissent– a majority of ACCA today authorized a rehearing on the sentence in this unpublished en banc decision. United States v. Gaskins, No. ARMY 20080132 (A. Ct. Crim. App. Feb. 10, 2011) (en banc). Judge Hoffman wrote for the majority, joined by five other ACCA judges. Judge Sims, joined by Chief Judge Tozzi, disagreed, advocating instead the remedy that Judge Ham the Great had proposed. Judge Gifford also dissented, writing separately to reiterate the now departed Judge Ham the Great’s rationale. I suspect that this case may pay another visit to 450 E Street before it returns to Vicenza, Italy. The writ that CAAF issued on Thursday in Gaskins v. Hoffman, __ M.J. ___, Misc. No. 11-8004/AR (C.A.A.F. Dec. 9, 2010) (summary disposition), appears to be the first time that CAAF granted actual relief on a petition for extraordinary relief or writ appeal (as opposed to ordering a remand, as in Denedo), since 2006. Gaskins was an en banc ACCA decision that found the record to be incomplete due to its failure to include a defense exhibit. United States v. Gaskins, 69 M.J. 569 (A. Ct. Crim. App. 2010) (en banc). (The No Man discussed the decision here.) The majority ordered the case remanded for a DuBay hearing “to determine if an omission is substantial, to determine if reconstruction is possible, and to facilitate any reconstruction.” Controversially, the majority stated, “Defense counsel should provide input in such a reconstruction.” Judge Ham the Great dissented, arguing that a remand to try to reconstruct the exhibit would be a waste of time. She also objected to expecting the defense to participate in the missing exhibit’s reconstruction. And she accused the majority of launching an “appellate ‘rescue mission. '” Judge Ham the Great wrote an extensive analysis of the omitted exhibit, its significance, and the law governing substantially verbatim transcripts. She concluded that the appropriate remedy was to disapprove the adjudged and approved DD and knock the confinement down from 12 years to 6 months. Judge Gifford joined in her dissent. Chief Judge Tozzi also dissented, but wrote separately to disassociate himself from Judge Ham the Great’s “appellate rescue mission” characterization. Judge Sims joined Chief Judge Tozzi. On Thursday, CAAF put a stop to the appellate rescue mission, precluding the DuBay hearing from proceeding. The case will be returned to ACCA to determine the appropriate outcome. Judge Ham the Great will no longer be there. ACCA will now have to decide without her further input whether the omission was substantial. If so, it appears that ACCA will be left with no choice but to disapprove the DD and knock confinement down from 12 years to 6 months. Holy Toledo! CAAF issues a writ! Misc. No. 11-8004/AR. Daniel GASKINS, Petitioner v. Colonel John B. Hoffman, Colonel David L. Conn, Colonel Mark L. Johnson, Colonel Alan L. Cook, Lieutenant Colonel Eugene E. Baime, Respondents. On further consideration of the petition for extraordinary relief in the nature of a writ of prohibition, and Respondents’ show cause response, we conclude that ordering a factfinding hearing pursuant to United States v. DuBay, 17 C.M.A. 146, 37 C.M.R. 411 (1967), to reconstruct Defense Exhibit A is inappropriate under the facts of this case. Accordingly, it is ordered that the petition for extraordinary relief to prohibit the United States Army Court of Criminal Appeals from ordering a DuBay hearing is granted. The record is returned to the Judge Advocate General of the Army for remand to the Court of Criminal Appeals for further consideration of its other options in light of this action. We recently noted that CAAF denied the last 111 petitions for extraordinary relief and writ appeals on which it ruled. Since then, CAAF has granted two motions to stay and issued show cause orders arising from two petitions for extraordinary relief. We’ve previously discussed Code 46’s petition for extraordinary relief arising from the Parker capital appeal. See United States v. Navy-Marine Corps Court of Criminal Appeals, __ M.J. ___, No. 11-8005/MC (C.A.A.F. Oct. 8, 2010). Last Wednesday, CAAF issued another stay and show cause order, this time in response to Army DAD’s petition for extraordinary relief in Gaskins v. Hoffman, No. 11-8004/AR. The petition for extraordinary relief grows out of a divided en banc ACCA decision remanding a case with a missing sentencing exhibit to see if the missing exhibit can essentially be recreated. United States v. Gaskins, 69 M.J. 569 (A. Ct. Crim. App. 2010) (en banc). The No Man discussed the case, with an emphasis on Judge Ham the Great’s dissent, here. Army GAD’s brief in response to the show cause order is due at CAAF NLT 27 October. Here is a link to ACCA’s en banc opinion in United States v. Gaskins, No. 2008012 (A. Ct. Crim. App. Aug. 27, 2010). As a friend o’ CAAFlog who sent the opinion our way pointed out, Judge Ham (in a 23-page dissent) has some interesting comments for her fellow judges in the majority on the case. The majority finds omission of a defense sentencing exhibit, called the “Good Soldier Book” throughout the opinion, warrants a DuBay hearing to determine if the omission of the Gold Soldier Book was substantial such that the limits on the potential sentence in Art. 19, UCMJ and RCM 1103(f) are implicated. The case is now before us and I believe we should decide it. Applying the law as set forth in the UCMJ and the Rules for Courts-Martial, I would affirm only so much of the sentence as provides for confinement for six months, forfeiture of $884 per month for six months, and reduction to E-1. I cannot agree that applying the law Congress promulgated and the President implemented is an “extreme remedy.” Congress determined the appropriate remedy for an incomplete record and we are bound by it. Whether we agree with the result is not the question; it is the appropriate result under the law. The majority has instead decided to launch an appellate “rescue mission” to allow the government yet another opportunity to carry its burden and complete the record in this case. See United States v. Burris, 21 M.J. 140, 145 (C.M.A. 1985). Dubay hearings are not meant as a vehicle to administer appellate “CPR” to the government’s case. Nor should this court, in ordering a Dubay hearing, be in the business of instructing the government how it should best attempt to carry its burden. See United States v. Gaskins, ARMY 20080132 (Army Ct. Crim. App. 27 Aug. 2010) (order) (unpub.) (Appendix). Specifically, this court should not direct the government to search for specific documents in order to reconstruct the missing exhibit. Additionally, this court should not choose the questions it directs the Dubay judge to answer with an eye toward finding the facts it needs to affirm the sentence in the case, rather than simply finding the facts the majority asserts are necessary to decide the legal issue presented. I wonder if the majority judges want their hail and farewell (or whatever the Army calls it) gifts back?